Robert F. Kennedy i 1964. 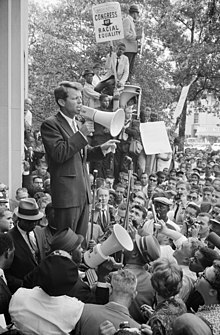 Polaiteoir de chuid na Stát Aontaithe ba ea Robert Francis "Bobby" Kennedy, no RFK mar a tugadh air go minic, (Gaeilge: Roibeárd Proinsias Ó Cinnéide; 20 Samhain, 1925 – 6 Meitheamh, 1968). Ba dhuine de theaghlach iomráiteach Kennedy é, agus bhí sé ina Ard-Aighne i rialtas a dhearthár John F. Kennedy, uachtarán na Stát Aontaithe idir 1961 agus 1963. Tar éis bhás JFK , toghadh Bobby ina sheanadóir do stát Nua Eabhrac. D'fheallmharaigh an Palaistíneach Sirhan B. Sirhan Bobby Kennedy i Los Angeles, California sa bhliain 1968. Kennedy ag caint le slua cearta sibhialta lasmuigh an Ionad Roinn Dlí ar 14 Meitheamh, 1963. ↑ Schlesinger, Arthur M. Jr. (1978). "Robert Kennedy and His Times", pg 150. ↑ Schlesinger, Arthur M. Jr. (1978). "Robert Kennedy and His Times". Tugadh an leathanach seo cothrom le dáta an 24 Aibreán 2018 ag 22:50.